they are eligible to apply for this Gujarat State Govt Ayurvedic Colleges Lecturer Jobs Recruitment 2017. There are total 81 Lecturer jobs in Ayurvedic College of Gujarat State. Interested candidates can submit the application form online through GPSC official website of www.gpsc-ojas.gujart.gov.in on or before 01-11-2017. Selection for this Ayurvedic Lecturer jobs will be based on Preliminary Exam and Interview. 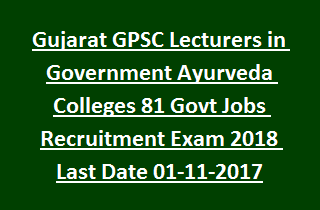 For more information read the below given data for Ayurvedic Lecturer Jobs in Gujarat GPSC. There are total 81 Lecturer vacancies in Ayurveda Colleges of Gujarat. Upper age limits for all the candidates is 47 Years. Candidates must have completed Post Graduation of MD/MS in respective Subject. And should have at least 10 years of Teaching Experience in respective subject. Must have knowledge of Computer Usage and adequate knowledge of Sanskrit and Hind or Gujarati. Selection for this GPSC Lecturer jobs of Ayurveda college will be based on prelims exam and interview. Eligible candidates can submit application form online through www.gpsc-ojas.gujart.gov.in on or before 01-11-2017. Before applying online see the vacancy details and qualifications details and read the application procedure and then proceed to apply. Fill all the required information and upload passport size photo, signature images. Submit the application form on or before 01-11-2017 and pay the fee in E post offices.